Earth week April 18th-25th 2015 was successfully organized and managed by UB students this year, with a very impressive turnout and participation by their peers. 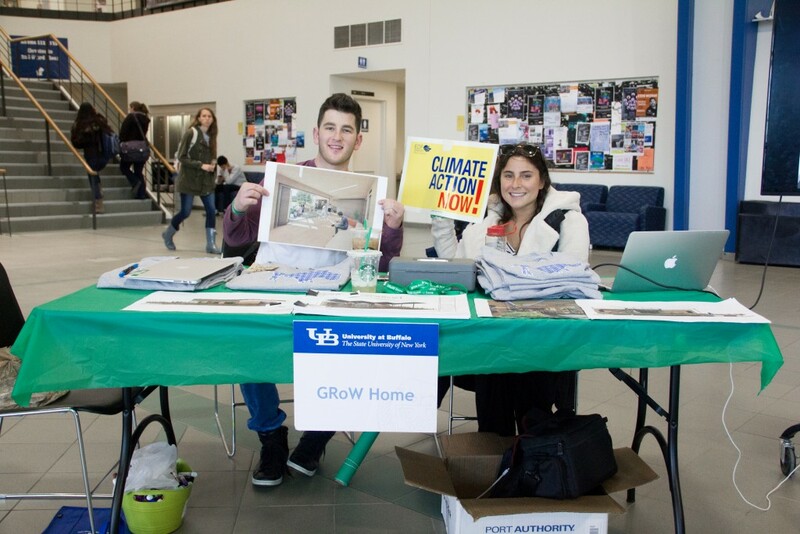 GRoW Buffalo decided they wanted to get involved towards promoting sustainability, while also spreading their name. 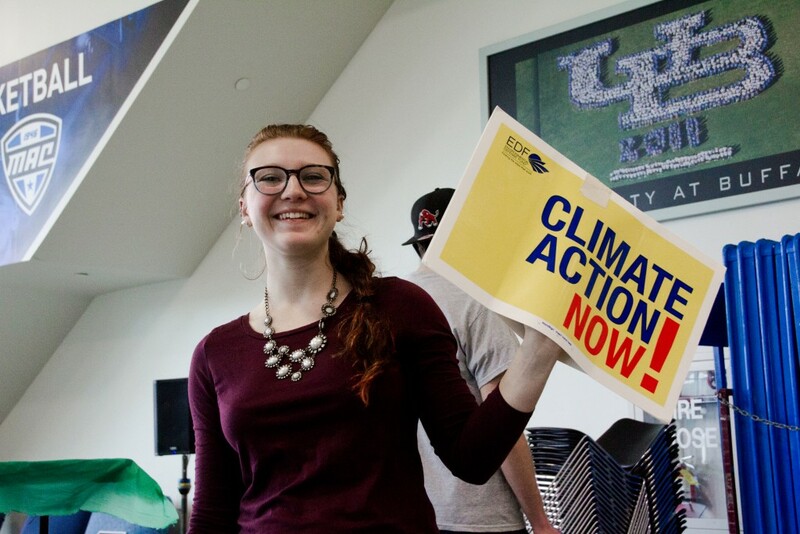 Our Communications GRoW class participated by going to the Earth Week meetings every week, and collaborating with the other similar clubs to create a thriving and effective Earth Week. The main theme of the week was celebrating our collective efforts to “green it forward.” There was a plethora of groups that had tables set up in the Student Union to spread their brands. 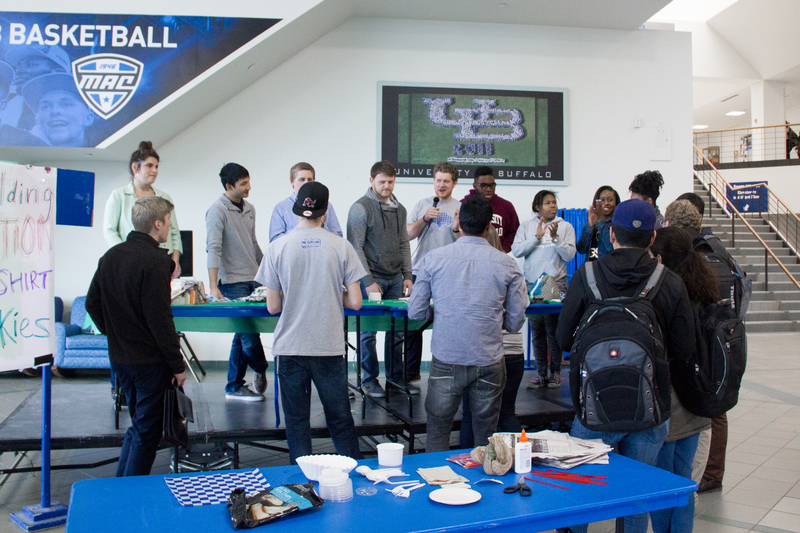 More specifically, each group had tables with their own events going on. The Campus Garden group had people planting seeds and painting containers to prep for the upcoming growing season at their tables. The Campus Garden group also had a kayaking event on Lake LaSalle. People volunteered to help them cleanup the neighboring area with the kayaks which was hosted by OAC and Outdoor Pursuits. The Campus Dining participated in Earth Week by promoting their use of locally grown foods on campus, which supports the local farming business. I also thought it was really cool that they had SLICE awards for green initiatives on campus and a reception afterwards with food and drinks. At UB’s first annual Sustainability Summit Join the green carpet was rolled out for Green SLICE awards; Erik Foley, managing Director of Penn State’s Sustainability Institute, shared insights about Penn State’s innovative approach to integrating sustainability. This was really helpful for UB to get such great ideas from an expert who managed this at such a big school before. 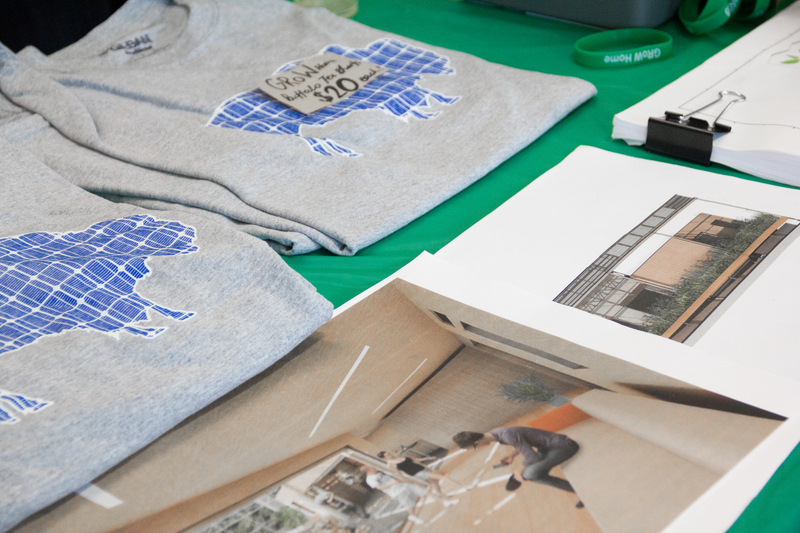 GRoW greened it forward by selling shirts and bracelets in order to raise funds for the Solar Decathlon coming up in October! Tuesday, April 22nd there was a select amount of people who were taken on a tour of the GRoW home. Thursday, April 24th was GRoW’s main event to raise money and build attraction to the UB community during earth week by having a house building competition. 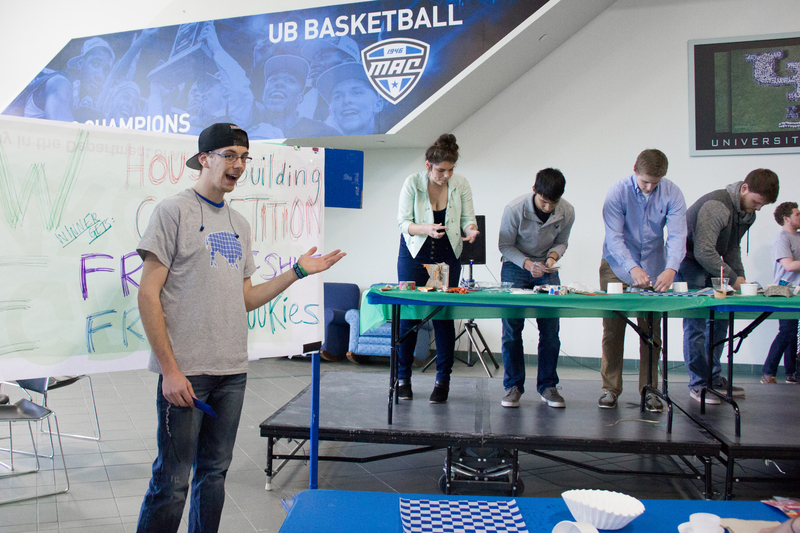 As you may assume this was not a regular house competition, the contestants had to build the best solar energy houses! The contestants got scissors, glue, tape, clay, and recycled materials to build their own version of a house to compete in the Solar Decathlon. The judges tested the houses for things such as water resistance, wind, and general stability. 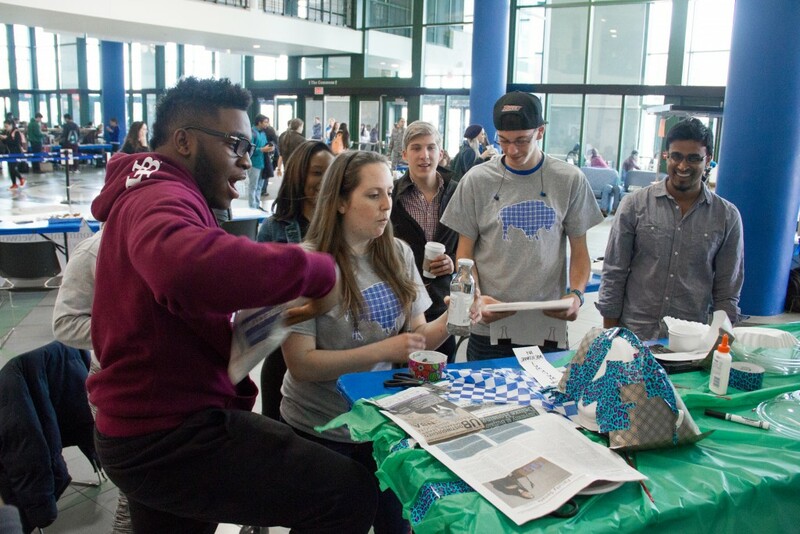 This was a great opportunity for GRoW to get their name out their, and get more people in the UB community to support them, which it most definitely was a success! This entry was posted in On Campus on April 26, 2015 by .